This display explores the pioneering role that painters such as Francis Bacon, Lucien Freud and David Hockney played in the reinvention of figurative art in the second half of the 20th century. 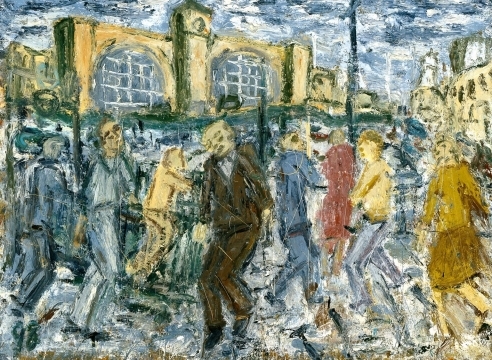 In Post-war British art radical work tended towards various styles influenced by the modern art of Paris and New York such as Surrealism, abstraction and Pop Art. Alongside these parallel movements there existed another kind of art pioneered by a group of loosely associated artists later labelled The School of London. What they had in common was a firm belief that they could find new ways to create realist paintings and reinvent the representation of the human figure to make it relevant in a world traumatised by the Second World War. Many of this group of figurative painters were to be found drawing in the National Gallery, London when not in their studios. They studied the art of the Renaissance and of Impressionism with a passion, seeing the pioneers before modern art as their teachers. Their work also had origins in pre-War British art: in the painting of Walter Sickert, David Bomberg and the realists of the Euston Road School. Through the 1970s and 1980s their work gradually began to be recognised as amongst the most important British art of its time. Who could be considered part of this undeclared group has always varied but Francis Bacon, Lucian Freud, Frank Auerbach, Michael Andrews, Leon Kossoff, Euan Uglow and the more Pop Art-associated David Hockney are regarded as the key artists. Between them they found new ways of looking intensely at the world around them; to combine in paint what they saw, with what they felt. The display includes works by Bacon, Freud and Hockney from the collections of Manchester Art Gallery and The Whitworth Art Gallery alongside works from the Arts Council Collection, London. An Arts Council Collection Partnership supported by Christie’s.